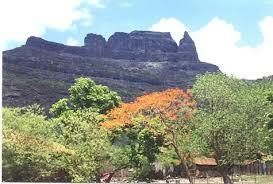 Haji Malanggad is fort near about 15 km from Kalyan in Thane district. It is the religious place known as Sri Malang or Haji Malang. Shilahar Raja built the fort of Malanggad. The ancient temple of Machhindranath is on this fort. Haji Malang is the grave of a Muslim monk. Puja of Muslim monk is done by Hindu people. Yatra is on Magh Poornima. Like other forts in Raigad district, there is a difficult cone on the top, and a little below. Samadhi of Baba Malang is situated on the boundary of the Thane district and Raigad district. There is a very high mountain on the fort. There are fortifications, entrances, water ponds and towers on fort. From the top of fort, the Kurla-Mumbai area, the entrance to Panvel and the Matheran region are seen. By Bus is used to reach the base of the fort from Kalyan station. Bus frequency is 30 Minutes. Haji Manlag Darga is in between the Fort route. It takes 2 hours from the base to the fort.